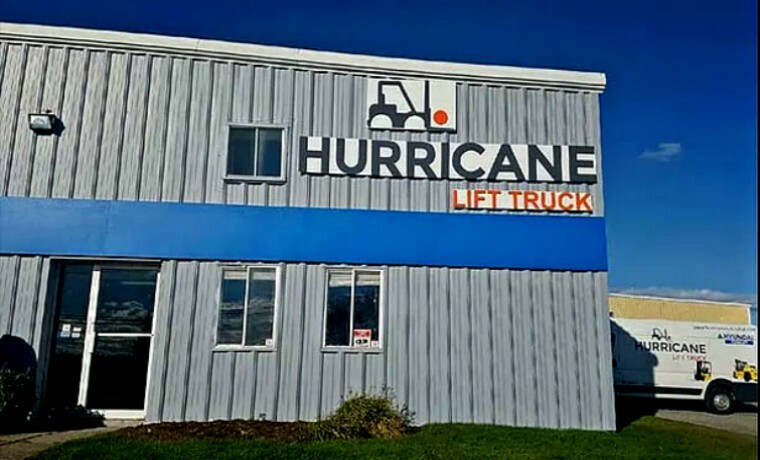 Since it first started in 1990 in Dartmouth, Nova Scotia, Hurricane Lift Truck has also had a presence in Saint John, New Brunswick. But, COO Jamie Thomson and his business partners knew it was time to look at setting up a bricks and mortar shop at 875 Bayside Drive in Saint John. “Our employees worked from home until the opening of our new branch office. The physical branch will allow us to provide a better level of service to our customer base. Additional parts stock, the ability to work on large repair jobs, an operator training classroom and a rental fleet are a few of the additional services the physical branch will offer,” says Thomson. The business specializes in sales, leases, rentals, parts and service of all brands of lift trucks that use a variety of fuel sources including, diesel and LPG (propane) as well as providing operator training. Hurricane has a broad range of lift truck rentals including sit down electrics, narrow-aisle-reach trucks, and lift trucks with a lift capacity of 15,000 lb or more. Thomson says Hurricane Lift Truck works with Hyundai, Linde, Blue Giant and Load Lifter. On top of Dartmouth and Saint John, it also has a location in St. John’s, Newfoundland. Another thing that sets it apart from others in the industry is the ability to offer critical operator training. “Courses are designed for both the new operators and the experienced operators who require a refresher course. Operation of any type of material handling equipment requires formal training and qualification. On average, a lift truck weighs approximately twice as much as its rated lift capacity. So, a 5000-lb capacity lift truck will actually weigh 9000 lb with no load on the forks. This has the potential to cause serious injury or death to the operator and/or pedestrian,” says Thomson. There are plans to begin courses in Saint John in 2019. The courses last a full day and include classroom and hands-on training with lift trucks as well as a final written test. Hurricane’s New Brunswick location currently has 5 employees but there is hope as demand increases, more technicians could be hired onto the team. “A physical branch will give us a visual presence, `which will create a greater awareness of our business in the city. With the awareness and the branch, our staff will find it easier to identify our business and its offerings with current or prospective customers,” adds Thomson.